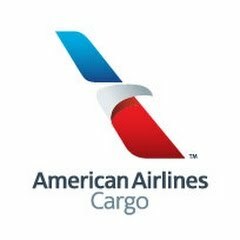 1st Glimpse at 2016 Trade Data, and What it Means for 2017 - WorldCity, Inc. Become a Trade Connections Member today. Click here for more info. U.S. trade fell in 2016 for a second consecutive year, begging the question of what it means for 2017. 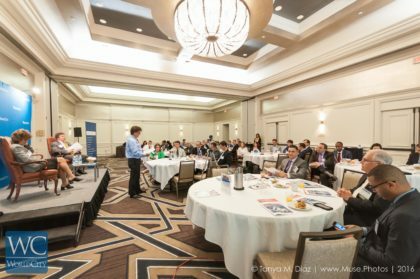 WorldCity President Ken Roberts revealed some of the trade data Friday morning at the Hyatt Coral Gables, with a panel of experts and room full of trade professionals parsing that data for what to expect moving forward. 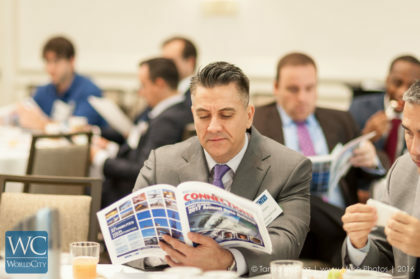 A Trade Connections member reads the program from the 2017 Annual Data Release. Become a member today! So where will we be a year from now? That was the question posed to panelists Romaine Seguin, President of UPS Americas Region, and Dr. Jerry Harr, a professor, researcher, and consultant in strategic planning, international management, and marketing at FIU. 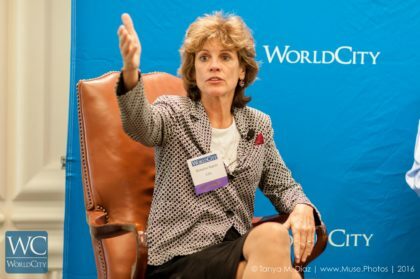 Romaine Seguin, President of UPS Americas Region, served as a panelist at Trade Connections. Dr. Harr observed 2016 was not a good year for the Americas region but sees the business cycle bottoming out with indications of small growth around 1.5% for 2017. Drilling down into that number reveals which countries should grow the most in the region: Panama (6.4%), Dominican Republic (4.5%) Colombia (3.0%). However, the two nations in the region in the worst shape moving deeper into 2017 are Venezuela and Ecuador, with both expected to see declines of more than 4%. For Venezuela, it’s about supply shortage and inflation, with companies, including UPS over the past 4-5 years (as noted by Seguin), ramping down business in that country. For Ecuador, the long-term prospects are much more promising than Venezuela but likely not for 2017. What is driving growth in Panama? Public works expansion and financial sector reform are big factors in the 6.4% expected growth for Panama in 2017. Dr. Harr noted Panama is also making plays to become a convention site, using the example of a pharmaceutical company wanting to have a conference in Miami but could potentially run into visa problems for business reps from Middle Eastern countries with the new administration. Why not just have the convention in Panama? 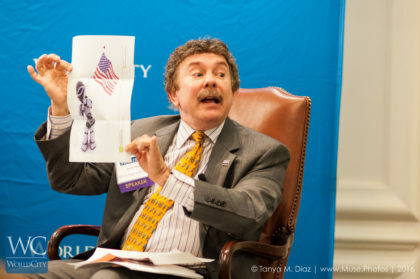 Panelist Dr. Jerry Harr shows a humorous picture of a robot worker waving an American flag. Seguin even noted how impressed she was by Panama at the amateur golf championship held in that nation, sponsored by The Masters and USGA. More importantly though, the Panama Canal continues to be vastly valuable to a logistics powerhouse like UPS. 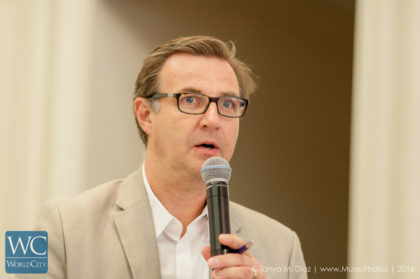 Easily the most energetic answer of the discussion came from a question from Swiss logistics company M+R Spedag Group and its Americas Vice President Stephan Bucher, who asked about the potential isolationist push within the United States for more “Made in America” products and jobs and highly motivated Chinese investors who may be scared off from trade with the U.S. due to more potential isolationist policies. The question sparked a conversation about how trade now has a bad connotation in the United States after election cycle rhetoric from Donald Trump and Bernie Sanders. And if you want to believe political candidates who say they will restore those old obsolete manufacturing jobs, Dr. Harr says he’s got a bridge to sell you too. But those statistics are not what you’ll hear on the evening news or campaign trail, and it’s not what millions of middle class workers in the United States believe who have seen their wages go down, leading the a knowledge gap when it comes to the benefits of trade. Seguin said there’s no stopping those developments in automation. She believes her eight-year-old niece will never drive a car because of automation. UPS is using drones already to deliver humanitarian aid in Rwanda, but she notes some jobs are still better with the human touch. So ultimately, the trade community must get the message out there more effectively to explain why the benefits outweigh the drawbacks for the working class. Dr. Harr noted outside big urban areas since 2011, manufacturing employment has increased 33%. The job growth is for people with more than a high school diploma but less than a four-year degree. The apparel and textile industry has a $320 million surplus on imports from Mexico. State economic development agencies in North Carolina worked with the private sector to retrain workers in new companies, like the furniture industry, and those companies found it made more sense logistically to keep the jobs in America than China. 67% of the Ford Taurus is made in America, even though it is assembled in Mexico. U.S. services exports has a $300 billion surplus, including the export of education services. These are the stories in trade nobody is talking about. To the American workers that believe they lost their jobs to another worker outside the country, Dr. Harr not only pointed to the statistics that dispute that but also provided sound advice and perhaps a solution to the problems of workers getting lost in the technological shuffle. “And there’s so much technology out there to find (professional education),” added Seguin. Dr. Harr also stressed for those initially entering higher education in hopes of better job placement to find out what the projected demand is in that field before wasting time and money on a degree that may not bear fruit. 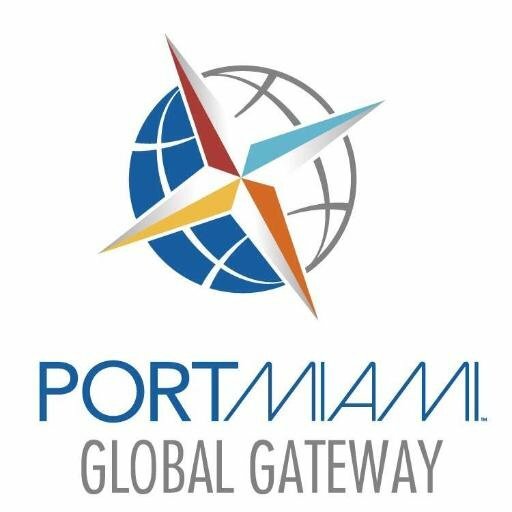 Join us May 5th for WorldCity’s World Trade Month Kick-Off Luncheon and 17th Annual Release of Miami TradeNumbers!